The creators of fiction set in zombie-populated worlds seem determined to paint a particular picture of humanity: that even though you'd think having zombies to worry about would stop us from killing each other, it wouldn't. 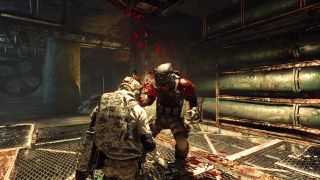 Umbrella Corps, the multiplayer third-person shooter that Capcom announced last month, is no exception. Umbrella Corps is technically a Resident Evil game, despite its obvious differences from the rest of them, so when you load up a multiplayer match you'll enter a world full of zombies. But while you can kill the undead they're not your main threat: your opponents, controlled by other players, are human beings. This video showcases a mode that works well as a gameplay trailer: a three-minute 3v3 team battle called One Life Match Mode. As the name would suggest, you don't get to respawn. The video is commentated by two guys, one of whom calls himself "Mad Skills Mike" and then cracks a joke about "kills" being his middle name. As always, if that's not your kind of thing maybe watch with the sound off. Since this is a trailer, they're not really there to commentate as much as point out features for the benefit of potential consumers: "And with a few moments remaining the teams are hammering out their strategies using the tactical icons", for example. They also highlight things like the jammer that prevents zombies from attacking, until it gets broken. But are features like that enough to make Umbrella Corps worth trying when there are already so many popular multiplayer shooters out there?